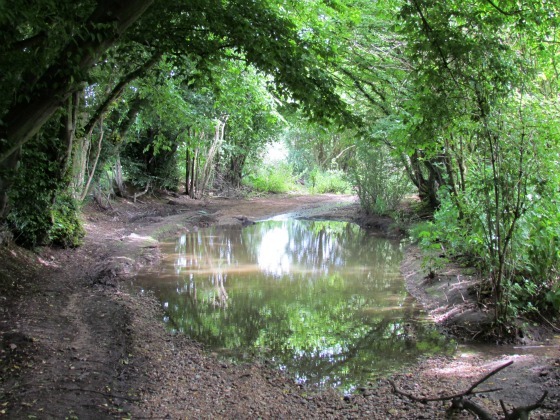 A gentle circular walk from Brookmans Park west to visit the swallow holes at Water End. There is a pub at the start and finish and one at the halfway point. The walk involves some quiet lane walking but is mostly along quiet footpaths through local woodland and across fields. 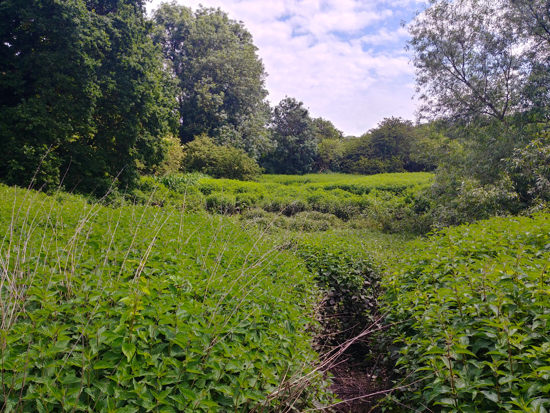 1: Begin the walk at Brookmans Park Station and head north along Station Road towards Welham Green. 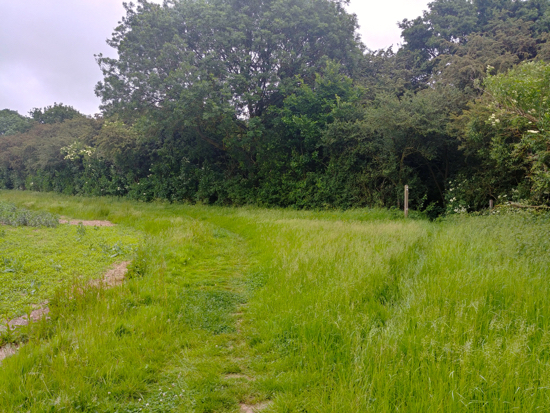 2: Just before you reach Bradmore Lane there is a path on the left (North Mymms footpath 9) which doubles back on the way you have just travelled to take you south, parallel to the railway track. 3: Continue along this route until you reach a bridge crossing a small brook, which is often dry. Immediately after the bridge turn right and enter a field owned by the Royal Veterinary College. A footpath area (North Mymms footpath 11) has been fenced off to the south of the brook. Follow that path with the field on your left and the hedge on your right as you head west until you reach the end of the field. 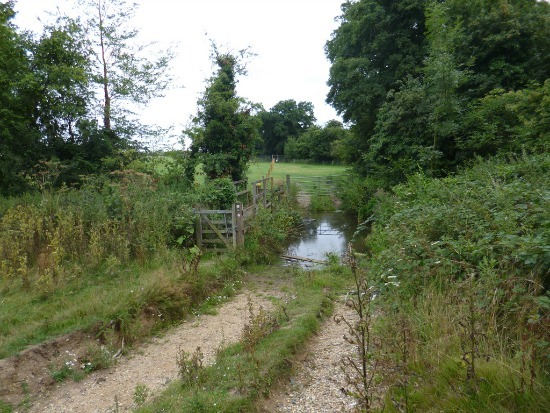 4: At the corner of the field you will see a stile on your right leading to a bridge crossing the same brook. Cross this bridge and, once on the other side, look out for a footpath gate on your left. Go through this gate and continue through Brick Kiln Wood with the brook running on your left and the wood on your right. The path soon opens out with fields on your right. Keep the hedge and brook to your left and continue. Ignore the first footpath on your left and keep heading west until the path swings to the left. At this point you join a raised walkway which continues along a boardwalk to the concrete footbridge over Mimmshall Brook. Cross the bridge. 5: When you reach Warrengate Road turn right and walk north to the village of Water End. You eventually come to The Woodman Inn. 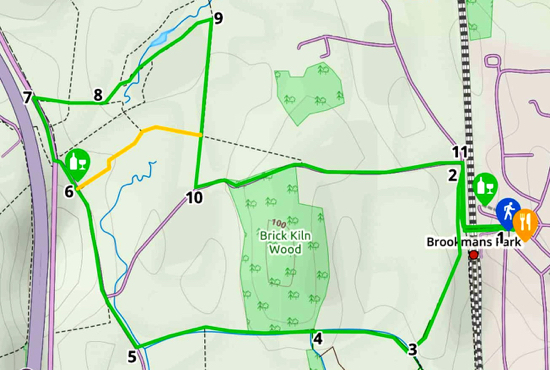 Here you have an option of taking the footpath on your right immediately before The Woodman Inn (North Mymms footpath 7) , and visiting the swallow holes (see the yellow route on the map above). If you take this option follow the path round over the swallow holes climbing through the woods at the other side to reach an open field. At the open field turn right, follow the path (North Mymms footpath 8) round to the right with the field on your left and the hedgerow on your right. Head for the south-west corner of this field and cut through the hedgerow to reach Bradmore Lane. Here you turn left and follow the lane to Station Road where you turn right, cross the railway bridge and return to Brookmans Park. 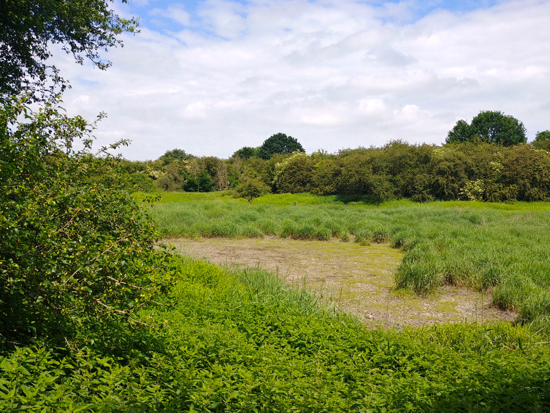 If you don't take this shortcut through the swallow holes, continue walking north-west past The Woodman Inn on your right until you reach Swanland Road. Here you turn right and walk along the cycle path and footpath past the garages. 7: Ignore the first footpath on your right and take the second (North Mymms footpath 30). Turn right and walk east keeping the hedge on your right and the field on your left. Ignore the footpath that crosses your way and continue heading to a way marker in the corner of the field. 8: Here you turn to your left and continue to follow the path with the fields on your left and hedgerow on the right until you reach another way marker and a footpath to your right (still North Mymms footpath 30). Go down this path, through the hedgerow and woodland, cross a bridge over the stream, and emerge in the open field. 9: Turn right on North Mymms footpath 32, and, keeping the hedge on your right and the fields on your left, following the path round to the south where it rejoins Bradmore Lane. Turn left on Bradmore Lane and follow the lane back to Brookmans Park.